The recently completed 344,445sqft VARENA shopping mall in Austria is one of the biggest and most environmentally friendly shopping malls in all of Europe. 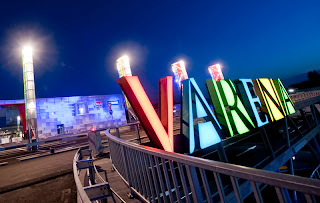 Costing more than 82 million Euros and hosting 28 high end clothing retailers, shoe stores, sporting good stores, cafes, and restaurants, VARENA is an important lesson in enormous structures can be made eco-friendly. One of the ways that VARENA achieves eco-friendly performance is with its outdoor lighting. Using Griven's outdoor LED modules, VARENA is able to color its campus with vibrant lighting while keeping its energy consumption to a minimum. Griven has long been one of the world leaders in outdoor lighting and at VARENA Griven has helped the complex draw attention to itself with alluring lighting while keeping daily operation costs reasonable. BulbAmerica stocks a wide variety of Griven’s phenomenal outdoor lighting products and an extensive array of outdoor LED products so you can create brilliant light wherever you want it while using little energy to do so. Feel free to leave a question or comment on this article, our Facebook, or call us at 1-877-620-1762 for any remaining questions you may have.